On February 23, at Miegusuku, Naha, family members offered their prayers for the repose of their ancestors. On February 23, January 16 in the old lunar calendar, a new year memorial service for the dead, called “Juroku-nichi-sai”, was held in Okinawa. Many families offered special meals and prayers to their family alters, in their homes or at graves, for the repose of their ancestors. 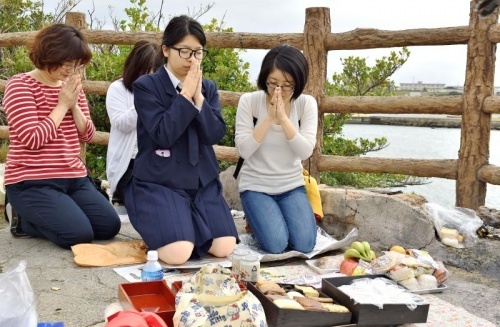 In the early morning, at Miegusuku near Naha Port, many families placed Jubako, or multi-tiered food boxes and flowers, and offered their prayers towards Miyako, Ishigaki, and other islands where their families came from.